Texas Democrats exercised considerable influence over the legislative process during the 2013 regular session, in contrast with their relative impotence last fall. While the November election results were unequivocally red, the legislation passed during the session was decidedly purple. On Nov. 6, Texas reaffirmed its status at the ballot box as the reddest of the nation’s major states, with Mitt Romney winning 57 percent of the vote to Barack Obama’s 41 percent. Simultaneously, Republicans garnered 24 of 36 seats in the congressional delegation, 19 of 31 in the state Senate and 95 of 150 of the seats in the state House. Texas Democrats exercised considerable influence over the legislative process during the 2013 regular session this spring, in contrast with their relative impotence last fall. While the November election results were unequivocally red — Democrats won a mere 12 of 31 senators and 55 of 150 representatives — the legislation passed during the session was decidedly purple. In the state Capitol’s west wing, House Democrats brokered a tacit alliance with the GOP’s moderate/centrist conservative bloc, led by Speaker Joe Straus, R-San Antonio. Liberal-Conservative Scores were calculated for legislators using their regular session roll call vote behavior (final 2013 House and Senate ideological scores and rankings will be published following the end of this summer’s special session or sessions). These scores indicate that virtually all of the most prominent Republicans on the speaker’s leadership team either were located in the GOP’s moderate conservative wing (i.e., representatives with Lib-Con Scores significantly less conservative than those of more than one-half of their Republican colleagues) or, and less commonly, in its centrist conservative wing (i.e., representatives with Lib-Con Scores neither significantly more conservative or less conservative than over one-half of their fellow Republicans). This alliance allowed a relatively cohesive and disciplined Democratic delegation to block the passage of most legislation opposed by its members. In a similar vein, the moderate conservative Republicans prevented the passage of almost all legislation they objected to either on pure policy grounds and/or because they believed it would damage the Texas GOP brand and in doing so undermine their long-term goal of maintaining the party’s grip on power in the state. Finally, this informal alliance pushed through bills that addressed several, though certainly not all, of these legislators’ most pressing policy concerns in areas ranging from public education to water infrastructure. On the other side of the Capitol, by remaining relatively united and skillfully taking advantage of the Senate’s two-thirds rule, Democrats blocked the passage of most legislation they opposed. Under the two-thirds rule, even bills backed by all Republicans still needed the support of at least two Democratic senators to pass. Like their House counterparts, Senate Democrats in many instances worked with moderate conservative and centrist conservative Republicans to pass legislation over the objection of the Senate’s most conservative members. The above dynamics are illustrated in the two figures which for each chamber array the legislators along the X-axis from most liberal to most conservative based on their Liberal-Conservative Score and include on the Y-axis the proportion of non-lopsided final passage votes (FPVs) where the legislator voted on the winning side. The figures reveal the informal alliance that existed during the regular session between Democrats and the moderate conservative and, to a somewhat lesser extent, centrist conservative wings of the Republican Party. This alliance produced predominantly purple legislation that was frequently opposed by the House and Senate’s more conservative Republicans. The end result was legislation that on average was closer to the policy preferences of the median Texas voter than to those of the median Texas Republican Party primary voter, an outcome viewed as positive by a majority of the 181 legislators, the editorial boards of the state’s leading newspapers and the Austin lobby, but perhaps not by a majority of the 1 to 1.5 million Texans who regularly participate in the GOP primaries. The figures reveal that the odd men and women out during the regular session were most commonly the more conservative Senate and House Republicans. 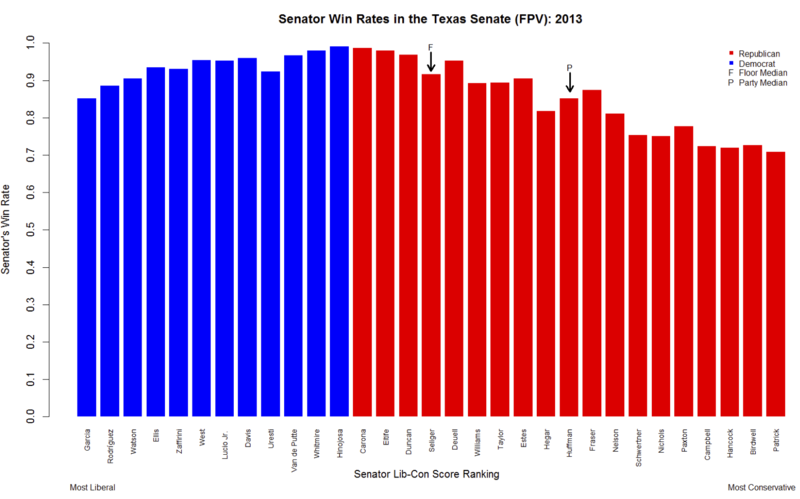 In the Senate, six Democrats and four Republicans (including the GOP’s three least conservative senators) had win rates on Final Passage Votes above 95 percent: Juan "Chuy" Hinojosa, D-McAllen, and John Carona, R-Dallas, at 99 percent; Kevin Eltife, R-Tyler, and John Whitmire, D-Houston, at 98 percent; Robert Duncan, R-Lubbock, and Leticia Van de Putte, D-San Antonio, at 97 percent; Wendy Davis, D-Fort Worth, Royce West, D-Dallas, and Eddie Lucio Jr., D-Brownsville, at 96 percent; and Bob Deuell, R-Greenville, at 95 percent. The FPV win rates of the most conservative Republican senators were substantially lower than those of these 10 pivotal senators, who virtually never found themselves on the losing side of a FPV, and lower than those of every Democrat. Nine Republicans, including the eight most conservative, had win rates below that of Sylvia Garcia, D-Houston, who was both the most liberal senator and the Democrat with the lowest win rate (85 percent). The four most conservative GOP senators were on the losing side of over a quarter of the FPVs in 2013: Dan Patrick of Houston, Brian Birdwell of Granbury, Kelly Hancock of North Richland Hills and Donna Campbell of New Braunfels. Senate Democrats had a median win rate of 95 percent, 10 percent higher than the Republican median. While the consensual Senate saw relatively few instances where the majority of the members of either party were on the losing side of a final passage vote (i.e., where the party was “rolled”), the Republicans’ 7 percent roll rate was more than double the Democrats’ 3 percent. The same pattern detailed above for the final passage votes also was observed for the “two-thirds rule” votes cast during the regular session. A similar dynamic existed in the west wing. Democrats rarely got rolled, with the majority on the losing side of only 5 percent of FPVs. In addition, the party’s FPV win rates were uniformly high, with a median of 94 percent and a narrow range of 97 to 88 percent. House Republicans were rolled twice as often as Democrats (10 percent). Furthermore, the Republicans’ median win rate, 84 percent, was 10 percent lower than that of Democrats, with a much wider range, from Allan Ritter of Nederland (99 percent) at one extreme to Matt Schaefer of Tyler (34 percent) at the other. While the unusually low win rates of Schaefer and a few of his movement conservative colleagues (e.g., Jonathan Stickland of Bedford, David Simpson of Longview and Matt Krause of Fort Worth) were possibly the product of a somewhat exaggerated tendency to cast nay votes, almost a quarter of the GOP House delegation had a win rate below 75 percent, including GOP House Caucus Chairman Brandon Creighton of Conroe. In the Senate, 47 percent (nine of 19) of the Republicans had win rates below that of the Democrat with the lowest win rate. 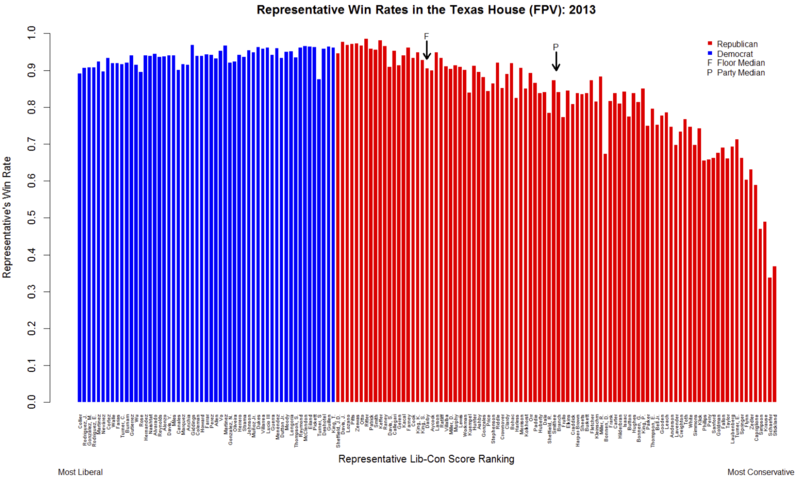 In the House, the proportion was even higher, with 61 percent (57 of 94; Straus generally does not cast roll call votes) of Republicans possessing a FPV win rate below the lowest win rate registered by a Democrat. Included among these 57 were, with one exception, every Republican possessing a Liberal-Conservative Score to the right of the party’s ideological median. The special session presently under way is all but certain to yield legislation that is notably less purple in tint than that produced during the regular session. This transformation is due in large part to Gov. Rick Perry’s decision to include on the special session agenda issues (e.g., abortion, redistricting) that are problematic for the informal alliance between Democrats and moderate/centrist conservative Republicans, Lt. Gov. David Dewhurst’s success in eliminating the two-thirds rule for the special, and the more limited ability of the speaker’s leadership team to utilize its control over the legislative calendar and procedures to prevent legislation that splits its informal coalition from reaching the floor. Over the past few weeks, Perry and Dewhurst have together thrown a monkey wrench into the legislative machine that had been smoothly producing purple legislation during the regular session, with the likely product being heightened inter-party discord and a more crimson-colored legislation emerging from the damaged machine later this month. 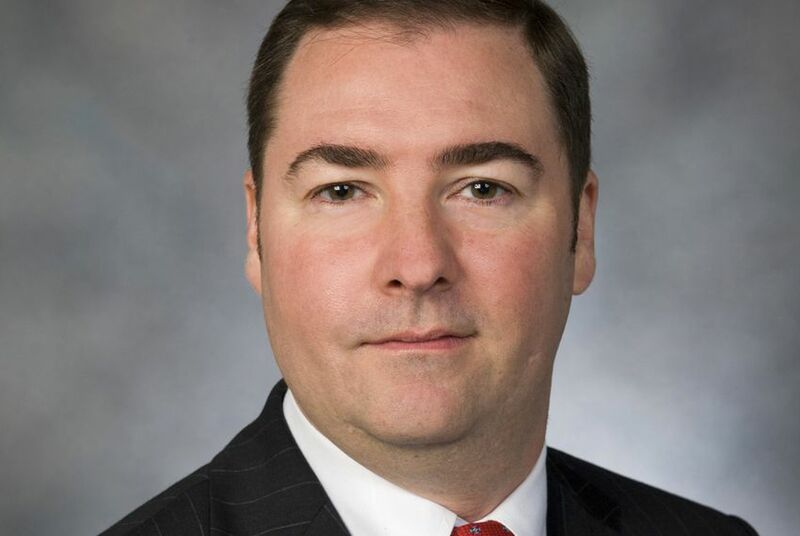 Mark P. Jones is the James A. Baker III Institute for Public Policy’s Fellow in Political Science, the Joseph D. Jamail Chair in Latin American Studies, and the Chairman of the Department of Political Science at Rice University.